Cleaning and organizing old files in my desktop found this. Several years ago I went through one of those personality and strength finder tests, among the reports their provide there is one that shows my five most dominant themes or talents. At that time I didn't look at it in detail. I have to admit the report it is pretty accurate and I don't mind to share if you like to get to know me better. 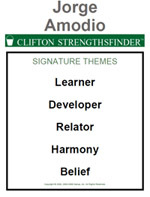 Your Signature Themes report presents your five most dominant themes of talent, in the rank order revealed by your responses to StrengthsFinder. Of the 34 themes measured, these are your "top five." You see the potential in others. Very often, in fact, potential is all you see. In your view no individual is fully formed. On the contrary, each individual is a work in progress, alive with possibilities. And you are drawn toward people for this very reason. When you interact with others, your goal is to help them experience success. You look for ways to challenge them. You devise interesting experiences that can stretch them and help them grow. And all the while you are on the lookout for the signs of growth—a new behavior learned or modified, a slight improvement in a skill, a glimpse of excellence or of “flow” where previously there were only halting steps. For you these small increments—invisible to some—are clear signs of potential being realized. These signs of growth in others are your fuel. They bring you strength and satisfaction. Over time many will seek you out for help and encouragement because on some level they know that your helpfulness is both genuine and fulfilling to you. If you possess a strong Belief theme, you have certain core values that are enduring. These values vary from one person to another, but ordinarily your Belief theme causes you to be family-oriented, altruistic, even spiritual, and to value responsibility and high ethics—both in yourself and others. These core values affect your behavior in many ways. They give your life meaning and satisfaction; in your view, success is more than money and prestige. They provide you with direction, guiding you through the temptations and distractions of life toward a consistent set of priorities. This consistency is the foundation for all your relationships. Your friends call you dependable. “I know where you stand,” they say. Your Belief makes you easy to trust. It also demands that you find work that meshes with your values. Your work must be meaningful; it must matter to you. And guided by your Belief theme it will matter only if it gives you a chance to live out your values. Copyright © 2008, Gallup, Inc.